In the market for a new streaming device? What about an HTPC? Maybe a new gaming system? What if you could have all of those rolled into one? 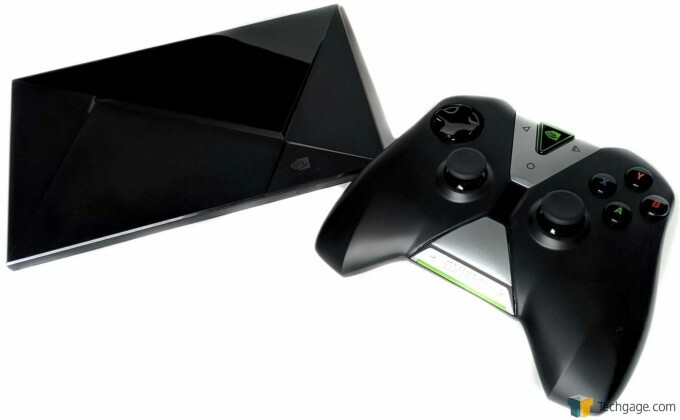 If I have your attention, then the NVIDIA Android Shield TV may be for you. Get ready for maximum couch time and maximum performance, but with minimum effort… and money! Since this is Techgage, there won’t be any sleeping or snacks, so let’s get cracking with our latest new tech review, the SHIELD Android TV. 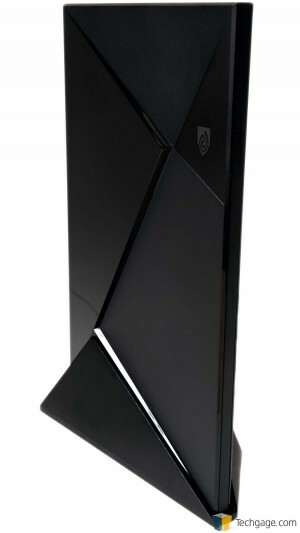 The newest entry in the SHIELD lineup differs from the portability of past offerings. Instead of allowing users to take a high quality gaming experience with them, the Android TV variant will keep your hind quarters glued to the couch with a ton of really fun features, high-performance gaming, and ultra high definition streaming. The newest Lollipop 5.1-equipped SHIELD comes in two flavours – the standard version with 16GB of storage, and the SHIELD Pro which ships with 500GB of space along with a copy of Borderlands: The Pre-Sequel, which is expected to drop September 1st. Both options include the SHIELD controller, but those living in the US will also receive a $30 Google Play card and 3 months of unlimited tunes on Google Play Music. Tough luck for the rest of the world I’m afraid. Under the hood, the SHIELD is powered by NVIDIA’s 256-core Tegra X1 processor, and if this means little to you, let’s compare that to the 72-core Tegra 4 featured in the SHIELD portable and the 192-core Tegra K1 processor tucked inside the SHIELD Tablet. 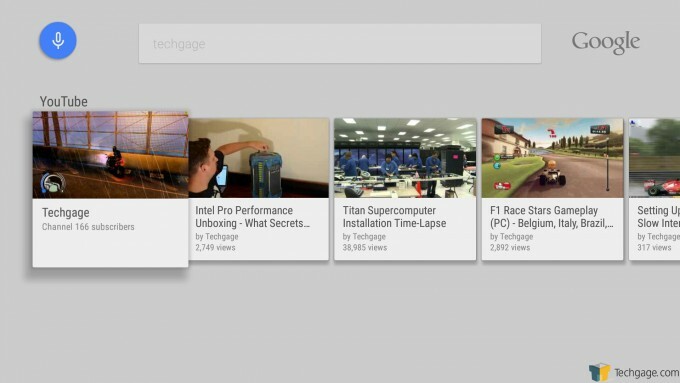 To help bolster performance, the Android TV version is further pumped up with 3GB of memory. For those who don’t care about RAM, HDMI, and all of those other geeky acronyms, feel free to skip ahead, but those who want all of the dirty details can have a look at the spec sheet below. On the rear of this asymmetrical little wonder are all of the ports covered in the spec sheet, but we felt that it warranted a closer look. From right to left we have the power connection, an HDMI 2.0 port that can handle DRM-protected content and 5.1 and 7.1 Dolby surround sound via HDMI pass-through, a gigabit Ethernet port, two USB 3.0 ports for external hard drives, flash drives, and peripherals, a mini-USB 2.0 port to connect the SHIELD to a PC for various tasks (such as Android Debug Bridge), and a micro-SD slot that can accept cards up to 2TB. Tucked away out of sight is 802.11 AC WiFi connectivity (which is backwards compatible for those without an AC capable router), Bluetooth 4.1 wireless connectivity for speakers, peripherals, and other bits, and an infra-red port on the front edge that allows the SHIELD to be compatible with Logitech Harmony remotes. Speaking of peripherals, the SHIELD controller looks similar to that of the SHIELD Portable, and the layout should be familiar to most gamers. Its middle-of-the-road size means that smaller hands shouldn’t have problems reaching the buttons, including the top mounted bumpers and triggers, while larger hands shouldn’t feel cramped. The silver accent at the bottom holds the volume controls, while the back, enter, and menu options are located on the silver accent at the top. 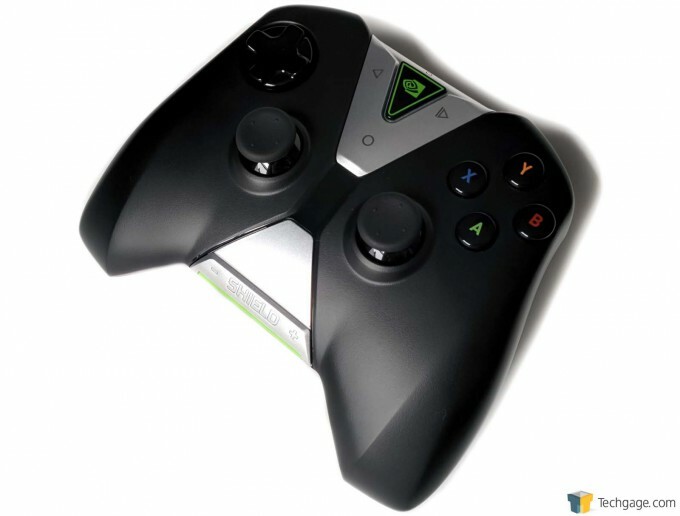 The NVIDIA logo in the middle doubles as the sync button that pairs it with any SHIELD device, and pressing it when synced enables voice search. The controller connects via WiFi Direct to take advantage of super fast, low latency communication. On the top edge are the USB charging port and headset port along with the right and left bumpers and triggers. Battery life is advertised at 40 hours, which should be more than enough for even the most rabid gamer. 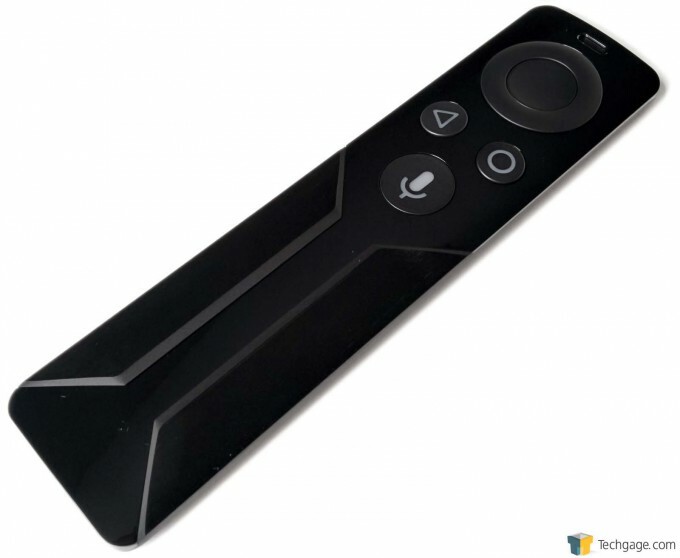 Those who would rather not wield a controller while searching the Web or watching movies also have the option of purchasing a separate remote. Buttons consist of a round navigation ring with the enter button in the middle, the menu and back buttons, and the voice search button. 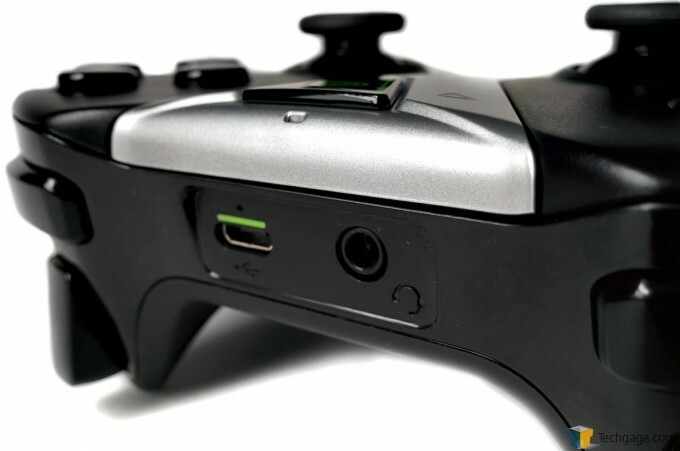 It features Bluetooth connectivity, and like the controller, sports a USB charging port, and a 3.5mm headset port. Wrapping up the available accessories is a stand that allows the SHIELD to be placed vertically. The heavy aluminum construction gives it the heft necessary to keep the system stable, and the rubber pad on the bottom has an adhesive-like coating to keep it in place and reduce the risk of having the unit slide around. We say adhesive-like due to the fact that it’s sticky, but it won’t ruin the surface that it’s placed on, or leave any residue behind. Included with the SHIELD is the power cable, an HDMI cable, and the USB charging cable for the controller and remote; but who wants to see a bunch of cables, right? Let’s get to the good stuff – the user interface. It’s impossible to show the entire home screen in one shot, but the screen capture below shows the bulk of it out of the box. 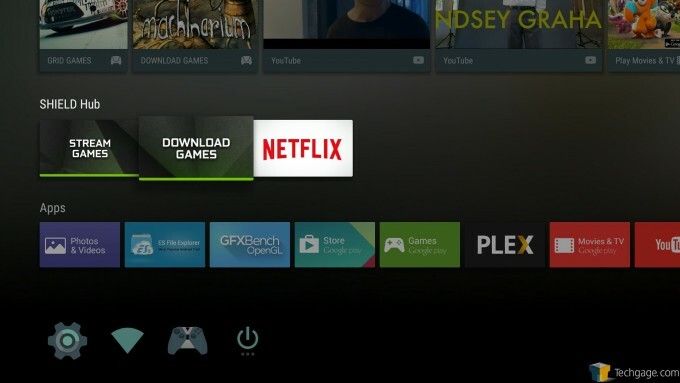 There are game and video recommendations at the top, and below that are where users can stream games using NVIDIA’s GRID cloud gaming service, download games from the Google Play Store, or watch some videos on Netflix. Below that is where any downloaded games would be displayed, followed by any installed apps, and finally, the system settings, network information, peripheral setup and power options are at the bottom. Let’s start with the games. Current Android users should feel right at home grabbing games from the Google Play Store. There are titles such as Half Life 2: Episode 2, Hotline Miami, and Badland. Flipping over to the GRID cloud service however gives access to some AAA games, such as most of the Batman Arkham-series, and a personal favourite, the original Borderlands. The list of games is constantly expanding, so if you can’t find what you’re looking for, give it time. For those who haven’t heard of the subscription-based GRID cloud service, it provides gameplay in up to 1080p at 60 frames per second (FPS), without the need to download the full game. The “heavy lifting” is performed at a data center so users are essentially playing on a high end system somewhere else in the world. In the shot below we left the SHIELD connected via WiFi and purposely kept it a fair distance from the router to show that the service will scale down the quality based on the signal strength and connection speed. 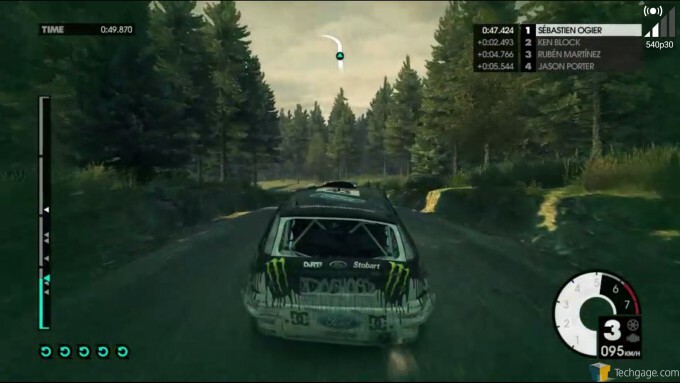 This is evident by the 540p30 icon in the top right corner which indicates that the video stream is running at 540p at 30 FPS. 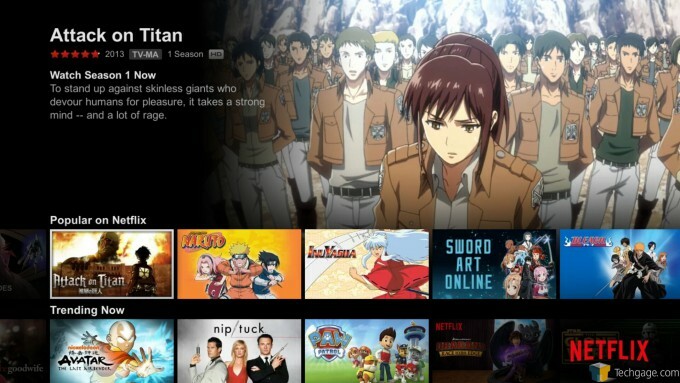 Watching movies on Netflix should be pretty simple for everyone thanks to the user-friendly interface similar to that found when browsing the standard website. The SHIELD Android TV allows for streaming of 4K video at 60FPS, which Netflix and YouTube already offer, although the former is only available as part of a premium subscription, and not all titles are available in 4K. Finally, there’s the search option. Users can manually search at the top of the home screen and enter in their queries letter by letter, but that’s for chumps. Thankfully, both peripherals have a built-in mic that allows for voice search. Hitting the sync button on the controller or the microphone button on the remote kicks off the feature that scours the Web for videos, as well as any installed apps and games on the SHIELD itself. Rounding out the features on the SHIELD Android TV are Google Play Movies & TV, Google Play Music, a photo and video viewer, and the ability to connect to any PLEX server.